Outdated communication formats based on print. Information overload. The challenges of verifying research claims and re-using results from experiments. These are some of the issues affecting the research community and slowing down their ability to share research.. Along with new tools, publishing models and current assessment metrics, these topics will be discussed and developed at the Beyond the PDF2 conference March 19 and 20 in Amsterdam. This event is organized by Force 11 (the Future of Research communication and e-Scholarship), a community of scholars, librarians, archivists, publishers and research funders. This community grew out of an earlier Beyond the PDF workshop at the University of California, San Diego, in 2011 with a follow-up session in Dagsthul. It was at these gatherings that a small group of like-minded individuals created a movement to change how scholarly information is created and shared using information technology. Today it also includes those who contribute their knowledge of emerging technologies, policies, funding mechanisms and business models. Apply for a travel grant by February 15. 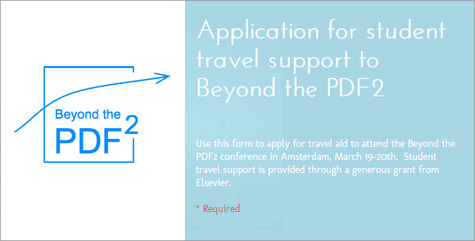 Elsevier is supporting the participation of young academics by making travel grants available, and Force 11 has already received submissions from Europe, North America and Africa. The deadline is February 15. To apply, submit your application here. The original conference consisted of free and organic discussion, with groups breaking off into sessions to cover the issues surrounding scholarly communication. The goal was to encourage face-to-face conversations among attendees in a way that fostered the creation of tools, frameworks, projects and collaborative partnerships. Participants talked about ways to make results, data and software accessible to researchers so they can verify and share data as they are pursuing their own research. Call it an “unconference” if you will, with the minimal amount of structure and the maximum amount of enthusiasm. From this came the Force 11 Manifesto, setting up the vision, problems to be solved, solutions and next steps that were agreed on by members and attendees. Another aim of the March conference is to broaden the participation of young academics (students and post-docs) by providing a platform for them to be agents of change. They are encouraged to bring ideas to challenge the status quo of present scholarly communication and how they see its digital future. “A new generation of scientists who have grown up in a social, digital age look at scholarly communication in an entirely new way,” explains Anita de Waard (@anitawaard), a founding member of Force 11 and VP of Research Data Collaborations at Elsevier. “For instance, they don’t necessarily see the paper as the core way to communicate their research. To encourage this movement, Elsevier is supporting a Vision incubator session, where attendees can present their ideas in 3-minute lightning rounds to a panel of academic, technology and publishing members. De Waard will be chairing this session, and Olivier Dumon, Managing Director of Academic and Research Markets at Elsevier, will be a judge. The flow of information will be two-way; students will also benefit from the experience of panelists who can offer support and insight into a world that is relatively new and that they are just beginning to navigate. Throughout the conference, students can receive input on their collaborations, workflows, tools and process pain points – and most importantly, find out where digital can benefit most from a newcomer’s outlook. 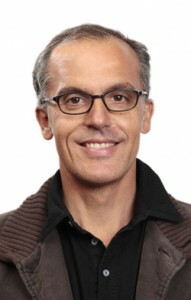 They are the “new researchers” and will demand other ways of measuring, communicating, collaborating and sharing information. They will go far beyond the PDF. As Project Manager for STM Journals Marketing Communications at Elsevier, Colby Riese develops outreach projects for early career researchers and for the company’s Content Innovation group. She is based in Amsterdam. Wish I had the chance!